Max Rise is only 14"
Pump's Specs: PLEASE scroll all the way down for important product information. Max Rise / Lift: 14"
Cord's Length to the Transformer from the pump, total length: 90" with 1/2" diameter male/female connection 18" from the transformer. Lights have a 10Watt bulb in each Finger or will accept 5Watt Bulbs too. * Lights need to be submerged when in use. 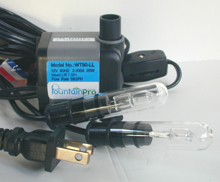 Transformers Cord to Plug: 72"
PLEASE NOTE: This pump will NOT operate any of the Large Taller Lion's Head Fountains.